Bordeaux is a slick new WordPress restaurant theme that could easily be modified to work as a WordPress cafe theme. The theme is developed by Orange Themes and is available for purchase at ThemeForest in two versions, a WordPress theme and a HTML template. Its appearance is rustic and offers a homey, welcoming vibe. The design of this theme makes it ideal for home-style restaurants, cafes, bakeries, and a variety of other businesses. And with a good selection of useful features and customization options, it’s easy to tweak this theme and make it fit your business perfectly. The design of this particular theme features a large sliding image gallery, which is displayed front and center. 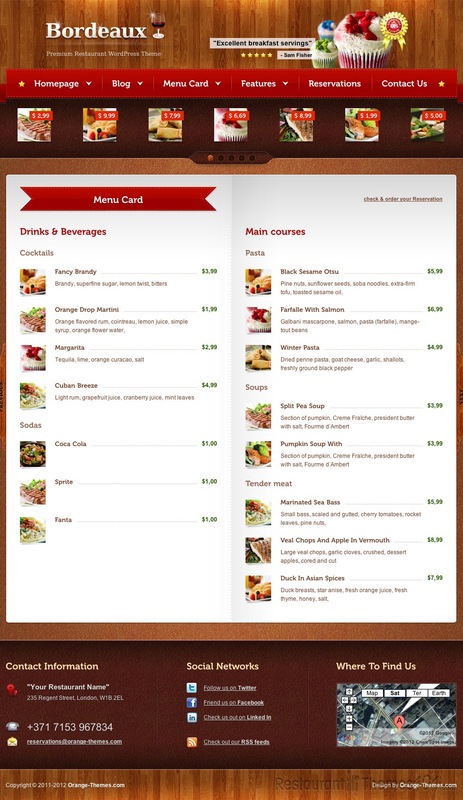 Directly above this slider is the menu area, where you can place links to your food menus, blog, reservation page, contact us page, etc. Under the slider is an area to put your actual food menus, or at least link to them. The design is excellent and really makes Bordeaux stick out from competing themes. 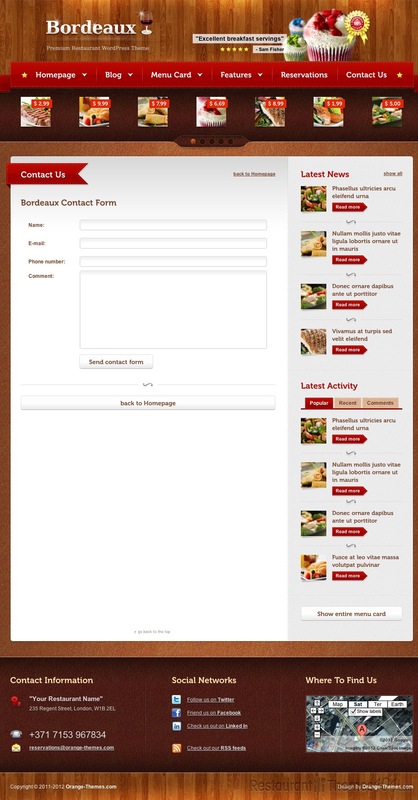 Bordeaux also has a variety of useful features to improve the functionality of your website. First off, it offers a reservation template, which you can set up to take reservations from clients online using a useful and simple calendar template. There is also a sidebar generator, which allows you to make custom sidebars for each individual page or post. 25 shortcodes are also included to help you customize buttons, spacers, layout columns, etc. And just like every other theme available from this developer, Bordeaux comes with the Orange Themes control panel, which allows you to edit colors, upload images, and much more. It is incredibly easy to use, even for novice webmasters. Lastly, this theme is also available as a HTML template.